Mike Glennon narrowly avoided a safety in the first half. An interesting play at the goal line involving forward progress during the Tampa Bay-St. Louis game. Here was the situation: Tampa Bay had the ball, third-and-4 at its 10-yard line with 5:11 left in the second quarter. St. Louis led 14-7. 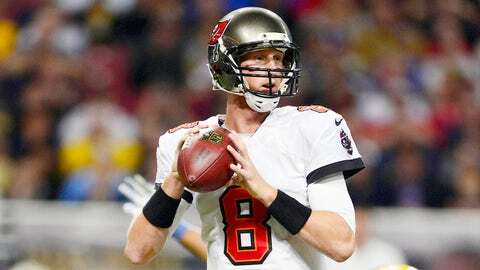 Bucs quarterback Mike Glennon dropped back to pass and was sacked at the Tampa Bay 1-yard line by T.J. McDonald. Rams coach Jeff Fisher challenged that Glennon was tackled in the end zone, which would have been a safety. I got a lot people questioning me on Twitter, saying forward progress is not reviewable. Not often, but it was in this instance. Forward progress is reviewable at the goal line and it is at the line to gain, the first-down line. And where the first contact was made by McDonald on Glennon, it was at the 1-yard line. It was easy for the officials to confirm.